Whether with shoyu or shoyu and sugar, mochi is a treat that brings Japanese American families together when the calendar turns towards the new year. At our family gatherings over the years, it’s become very clear: kids love mochi. It’s always fun to watch the young ones form their first mochi — usually more of the white mochiko power ends up on their faces and those mochi are rather deformed — but it’s all in good fun. 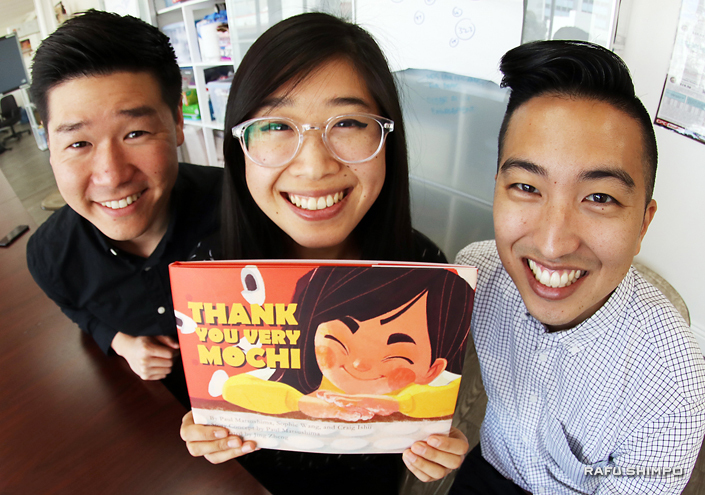 The children’s book “Thank You Very Mochi,” written by Paul Matsushima, Sophie Wang and Craig Ishii of Kizuna and illustrated by Jing Zheng, is a tribute to those family gatherings and offers important lessons learned through their youth training workshops. The tale follows Kimi, a little girl whose family has always made mochi with a machine. When the machine breaks down at Grandma’s house, the clan turns to Grandpa, who saves the day. Nikkei readers will love little details such as Grandma’s carefully sculpted hedges or a noren hanging from the kitchen window that evoke the lives of a typical Japanese American family. “They talk about the old ways, where the experience of mochitsuki came from. They learn an appreciation for why we do these traditions, why it’s important to family,” said Ishii, Kizuna director, in an interview with The Rafu Shimpo. The idea for the book came out of a mochitsuki workshop that Kizuna ran several years ago for the Japanese language school at the Gardena Valley Japanese Cultural Institute. Matsushima, who developed the workshop, ended up making a stone usu out of concrete for the children to take turns whacking the mochi with wooden kine mallets. 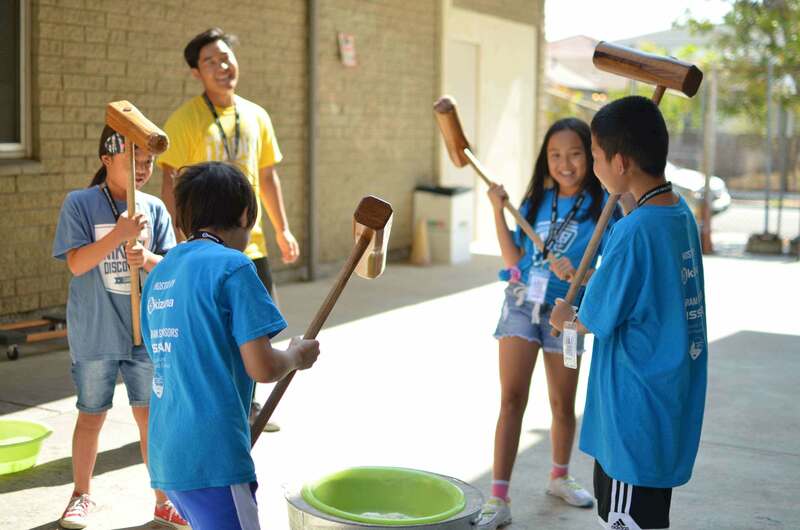 The mochi-making program has become an integral part of Kizuna’s summer workshops. “Kids really liked it, some of them never pounded before. They had grown up doing it with their families but used the machines, not the mallet,” Matsushima said. The book went through several concepts on the way to publication, including what Wang called “futuristic living in space, slime machines” before the group felt they had the right story. Each draft was shown to community leaders and parents whose kids participated in the program for their input. Wang, Kizuna development coordinator, noted that the story has transcended the organization’s core mission focused on serving Nikkei youth in the Southern California area. “Thank You Very Mochi” teaches the origins of the mochitsuki tradition. 11:30 a.m. More information on “Thank You Very Mochi” is available online at Book.kizuna.la/org. Since Kizuna has started mochitsuki workshops, young families have started their own mochitsuki. Ishii said that understanding these Japanese American traditions is vital to keeping them alive for future generations. He pointed to other traditions such as basketball and The Rafu Shimpo itself as examples.